This is where to find current vacancies within our coalition. If there are no openings listed, please check back at a later date. Thank you for your interest in working with Partnership Douglas County! Are you skilled in graphics and media communications? Have a passion for a healthy community? 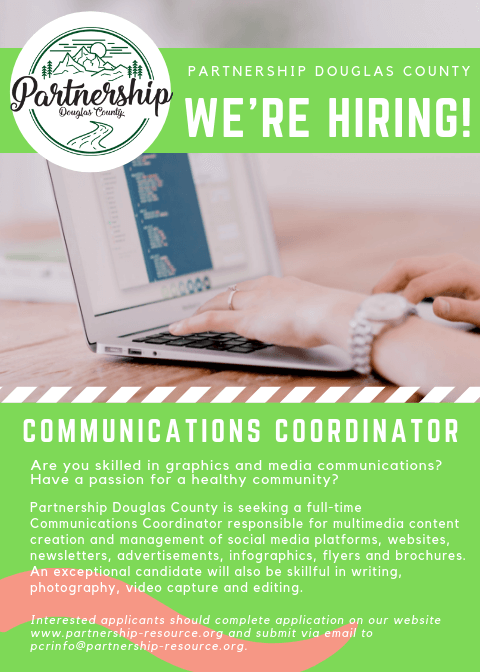 Partnership Douglas County is seeking a full-time Communications Coordinator responsible for multimedia content creation and management of social media platforms, websites, newsletters, advertisements, infographics, flyers and brochures. An exceptional candidate will also be skillful in writing, photography as well as video capture and editing. Interested applicants should complete the application found below and submit it along with their resume to info@pdcnv.org (with the job title as the subject line). Salary: $17-$24 per hour to start, depending on experience and qualifications. Status: 1.0 FTE (40 hours per week) or more. This is a grant-funded position. The benefits package includes sick leave, paid vacation and holiday pay. To Apply: Download application here and email it, as well as your resume, to info@pdcnv.org with “Communications Coordinator” in the subject line; to be considered, you must email your resume with the application. Note: PDC is a drug- and smoke-free workplace.